The Candle in the Wind, volume IV of The Once and Future King by T. H. White. Funny meeting Malory at the end. Saga of the Swamp Thing, Book One by Alan Moore. My Family and Other Animals by Gerald Durrell. Monthly “reading club” book at the office. The story is a real one, but in reality Larry, the older brother, was a married man at the time. So, we brought up an amusing theory: Could it be that Larry’s wife objected to appearing in the book, and the various objections and fears voiced by Larry (regarding Gerald’s menagerie) were actually the wife’s? The Yellow Admiral, volume XVIII of the Aubrey/Maturin series by Patrick O'Brian. The Ghost in the Shell by Masamune Shirow. Far inferior to the movie (which was a meld of two different chapters from the series, apparently). Author seems to believe in odd technical/spiritual mumbo-jumbo... His comments are far more annoying than enlightening. Spain, from The Time-Life Library of Nations (by “The Editors of Time Life Books”). I was always curious, but never before bothered to read, about the last Western European dictatorship. 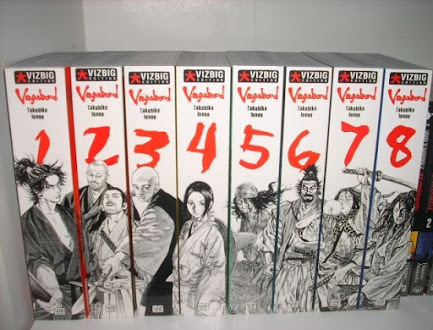 Vagabond volumes 1-3 (Vizbig edition volume 1), by Takehiko Inoue. Beautifully drawn and a captivating plot. A Tale of Two Cities by Charles Dickens. Shameful to admit -- the first Dickens I’ve ever read. I should definitely do this more often. Vagabond volumes 4-9 (Vizbig edition volumes 2 and 3), by Takehiko Inoue. As before, the art is just beautifully done. The amount of detail in the black-and-white pages (that is, most pages) is sometimes astounding, like nothing I’ve seen elsewhere. The color pages are less impressive, though I particularly liked those that use the outline-free style (perhaps best known from Lloyd’s work in V for Vendetta). The plot is often slow-moving (a single fight, five chapters?) but still very good. One great thing about the Vizbig edition of Vagabond is the spines; the image below is from Mormegil’s Blog, showing the first eight volumes. 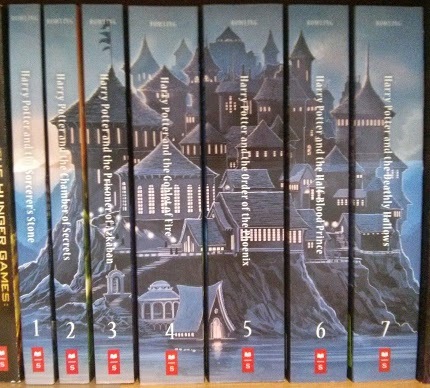 Since spines are so visible in bookstores, I wonder why this approach isn't used more often. I’ve only seen it twice before, in the three-volume The New Annotated Sherlock Holmes and in the five-volume edition of The Complete Aubrey/Maturin Novels. Now that printed books and physical bookstores are both soon to be a niche market, I guess this style won't suddenly become more popular. Oh well. Vagabond volumes 10-12 (Vizbig edition volume 4), by Takehiko Inoue. Ran out of Vagabond, must order more. The Hundred Days, volume XIX of the Aubrey/Maturin series by Patrick O'Brian. First D is killed (off-stage), and then B is killed (on-stage, but in such a passing manner!). Ugh. But at least 1813 is over. She Lover of Death by Boris Akunin. Volume VIII in the Erast Fandorin series. I’ve read the Hebrew translation, by Yigal Librant. As always, Librant’s translation is excellent, though I’m yet to understand why all the notes -- which I think are all translator’s notes -- are split between footnotes and end-notes, in what seems like a totally random manner. Song of Solomon by Toni Morrison. Breathtakingly beautiful. חמישה חלומות by עוזי וייל (Five Dreams by Uzi Weil). This book caused a mini-fiasco when it turned out that the author, who collected a respectable sum for it on a crowd-funding platform, actually had it practically all written by the time he asked for the money; and what’s more, he also had a signed agreement with a major publisher. So, people asked, what’s the point of crowd-funding it anyway? Me, I contributed to the funding, and so I’ve received a signed and dedicated copy -- can't really complain. Of course, I would have been even happier if the book was less of a disappointment. אתנכתא.קומית by עירד יבנה (Dot-Comic Relief by Irad Yavneh). I was given this as a gift by a dear friend. It’s a collection of Irad’s “scrolls”, famous for their wit in the Technion’s CS faculty -- and by now, far beyond. Here’s a sample in English, presented by Irad himself. Well, this is delightfully odd. I was reading Dennett’s Intuition Pumps, and one of the theories he discusses there is the “cascade of homunculi”, where the mind is composed of homonculi inside it, each having “a mind of its own”, composed in turn of its own homonculi; there’s no infinite regress because each nested level is simpler than the one before. This strongly reminded me of Minsky’s “Society of Mind” theory, with which I’m only vaguely familiar. Then, I read Papert’s totally unrelated Mindstorms, which I expected to be book about a programming language. It’s not; it’s much more than that, and, as it turns out, it was written while Papert was co-developing the “Society of Mind” theory with Minsky, and includes some relevant details about this theory, which chime in very nicely with what I just read in Dennett (Dennett’s text, though, was written a few decades later). Next, I picked up Surfaces and Essences (Hofstadter and Sander). And... their first example of analogies leading to scientific discoveries is with a quote of Poincare, explaining how some idea or another popped into his mind from the unconscious. These trains-of-chance are really amusing at times. Southeast Asia by the Editors of Time Life Books (from The Time-Life Library of Nations). Intuition Pumps and Other Tools for Thinking, by Daniel C. Dennett. At first, I wasn't sure if this was about “tools for us to think with”, or “the tools (internal mechanisms) with which we think”. The correct answer seems to be, “Tools for us to think with when we think about thinking” (or about consciousness, free will, etc.). Mostly a compilation of selected thought-experiments from Dennett’s earlier writings. The Property by Rutu Modan (read the Hebrew original, הנכס). Fascinating graphic novel. The leaves (endpapers) have an interesting almost-Japanese style of scenery that I would consider Japanese, except for the flag of Sweden in there. Drawing style in the comic itself is somehow very different. Alcatraz Versus The Evil Librarians by Brandon Sanderson. Read the Hebrew translation, after my son urged me to; he was fascinated by it. It seems like his curiosity was particularly piqued by the way the main character (in first person) speaks to the reader, breaking the fourth wall. Not a bad juvenile book, I guess. The Night Watch by Sergey Lukyanenko. Haven't really read “lightweight” Russian fiction before. (I assume the Strugatskys don't count as lightweight.) Enjoyable, but I probably won't be looking up the sequels. Has anybody read these? Opinions? All my friends know that I collect books. Few of them, however, know that I also collect imaginary books. No, I’m not talking about e-books; I’m talking about a list of fictitious titles that appeared inside other books, fiction or otherwise. Like, for example, S. Morgenstern’s unabridged version of The Princess Bride, or the works of Clare Quilty. Books from movies also appear in the list, such as Jasmine Yuen’s The Carrucan’s of Kurrajong from Kill Bill vol. 2, or Peter Dickinson’s The Flight of Dragons from the 1982 animated movie of the same name. So imagine my surprise when I found out that Dickinson -- a character in a fantasy movie, yes? -- is a real person, and his natural history, nonfiction treatise on the flight of dragons was published in 1979. I sadly had to strike that book from one of my collections, but was very happy to add it to the other. The Flight of Dragons by Peter Dickinson. Clearly (if sadly), the theory cannot be taken seriously, even though it even explains why we’re unlikely to ever find dragon remains. Beautifully illustrated by Wayne Anderson, in a style that also set the tone for the movie. Someone to Run With by David Grossman (read the Hebrew original: מישהו לרוץ איתו). A re-read. There was a mini-rage in internal discussion forums at my work recently, regarding the way some people use “ask” as a noun. Ask is, of course, a verb; the noun one should use is “request”. Well, except that “ask” is also a noun, and has been used as such for well over a thousand years, since the days of Old English. In more modern times, Thomas Twining wrote (1871): “I am not so unreasonable as to desire you to ... answer all my asks”. So, definitely not new. But the key problem here is that people don't realize that languages change, and this change is often good. Grammar rules that are constantly violated by native speakers of the language are not grammar rules -- they are meaningless fossils (and the editors of the Economist should be ashamed of themselves for their silly war against split infinitives. As always, if you love language, you should read Pullum). But what happened when a respectable dictionary first issued a new edition which embraced language change? Woe to them! The Story of Ain't, by David Skinner, tells the story of Merriam Webster’s 3rd Edition and the ensuing culture war. It’s far from the best-written nonfiction I’ve read, with too many meaningless digressions and too much character expositions, but it’s still a worthy read if you’re interested in the history of language. The Story of Ain't: America, It’s Language, and the Most Controversial Dictionary Ever Published, by David Skinner. התגנבות יחידים (Infiltration), by Yehoshua Kenaz. The story of a modern Quixote; odd, fascinating, and at times moving. The Hundred-Year-Old Man Who Climbed Out the Window and Disappeared, by Jonas Jonasson. I’ve read the Hebrew translation, by Ruth Shapira. The adventures of a Swedish Forrest Gump, naively changing history as he stumbles through it. Amusing at most; read following a recommendation by my son. He Lover of Death by Boris Akunin. Volume IX in the Erast Fandorin series. I’ve read the Hebrew translation, by Yigal Librant. Deuxième génération : Ce que je n'ai pas dit à mon père (Second Generation: Things I Have Not Told My Father), by Michel Kichka. I’ve read the Hebrew translation, by the author himself. (Is this really considered a translation?). Brilliant at times, but any Holocaust-related graphic novel will forever be compared to Maus, an no graphic novel (Holocaust-related or otherwise) can win such a comparison. Methuselah’s Children by Robert A. Heinlein. Horrible opening (several pages where a character narrates a history known to all his listeners, for the benefit of the readers); science that?s not even ludicrous; and yet fun to read. עוד ספר (Another Book) by Michael Handelzalts. A book about books, by a book lover, for book lovers. Second in a series. Not for you if you’ve moved to e-books, I guess. The Naked Sun by Isaac Asimov. Recommended it to my son, and re-read it myself so we could discuss it a bit. How often do science fiction (or fantasy) authors describe entirely new forms of art? Something that doesn't exist in reality, and perhaps isn't even possible without some new technology (or magic)? Interestingly, there’s one of these in The Naked Sun (Gladia’s goblets of light). Anybody familiar with other examples? החי על המת (The Living on the Dead) by Aharon Megged. There is something purely captivating in Megged’s storytelling. The Annotated Secret Garden by Frances Hodgson Burnett, annotated by Gretchen Holbrook Gerzina. Annotations were mostly dull and rarely of any depth. Several annotations regarded biblical references in the text, yet Gerzina managed to miss the connection from “the lamb and the fox cub keeping close to Dickon” (p. 212, and similar occurrences earlier) to “The wolf also shall dwell with the lamb ... and a little child shall lead them” (Isaiah 11:6). Embarrassing.